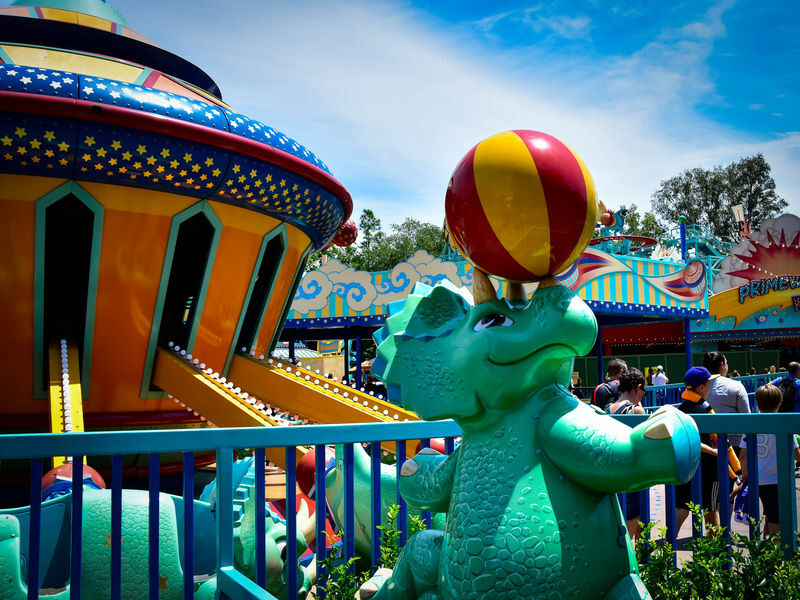 TriceraTop Spin is essentially Animal Kingdom's version of Dumbo the Flying Elephant. Here, each ride unit is a triceratops dinosuar. As with other versions of this ride, the units spin around the ride's hub while the riders control the up and down motion of the individual units. Location: To the back left of DinoLand, inside the Chester and Hester's Dino-Rama area. Wait Times: The line is slow moving, but rarely longer than 30 minutes and frequently shorter. Queue Description: None, the queue just wraps around the ride. Ride Access: Wheelchair and ECV users will enter through a gate near the regular admission gate. Wheelchair Transfer: It is necessary to transfer from wheelchairs and ECVs into the ride vehicles. Weight and Size Issues: At full capacity, the vehicles can be very crowded, but if necessary riders can sit alone in a row.